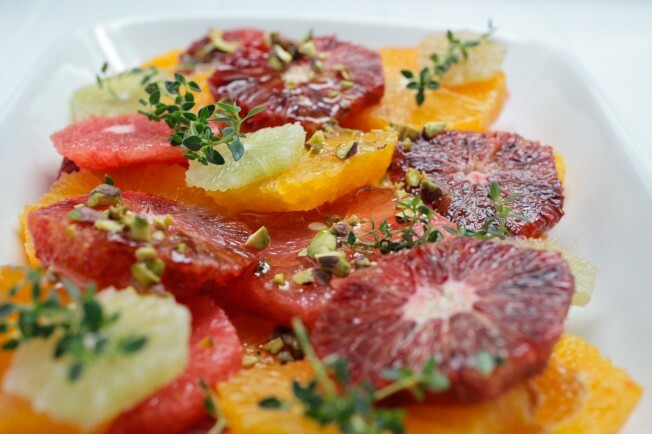 Citrus salad is purely delicious and great to eat for breakfast or creating it as a luscious dinner party dessert for good friends. You can enjoy on it’s own or topped with natural organic yoghurt. You can also serve this with smashed raspberry puree that takes it to another level of deliciousness. What’s good about it: Citrus is rich in antioxidants that can help boost immune function and protect the body against disease. The vitamin C in citrus helps synthesis of collagen that can break down as we age. Collagen is found in your skin, bones, tendons and ligaments and gives strength and structure. It’s vital for skin elasticity and firmness. Manuka honey works as an antibacterial to help fight virus and bacteria. Pistachios are high in the minerals potassium and magnesium to help nourish the nervous system when under stress. Peel – all the citrus fruit, ensuring all the white pith is removed. Slice – the citrus and arrange onto a serving plate, alternating colours to make it look beautiful. Combine – Manuka honey and vanilla then drizzle onto the citrus salad just before serving. Garnish – with pistachio and garden herbs.